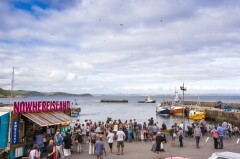 For his Cultural Olympiad commission, Alex Hartley created Nowhereisland and embarked on an epic journey. As that journey draws to an end, we catch up with the artist. “It’s quite a shock,” says Alex Hartley. “The project has been planned like any other art project, but the sea just hasn’t behaved!” As we speak, Hartley and his expedition team are sheltering from heavy storms that are battering Nowhereisland near the port town of Bideford, north Devon. It’s the last leg of a journey in which high winds and stormy waters have been par for the course. 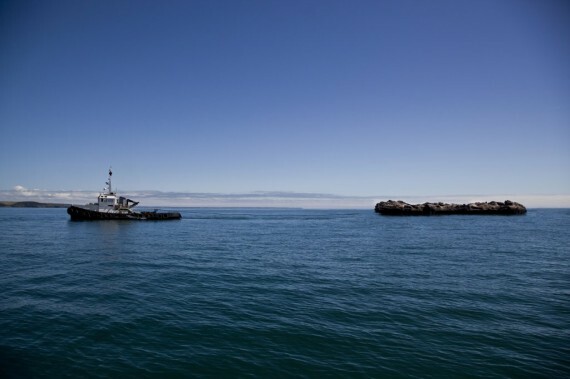 The epic work of land art has seen Hartley tow a small archipelagic island from the High Arctic region of Svalbard, Norway to the South West coast of England to coincide with the sailing events of the 2012 Olympics. Early in its voyage the island passed through international waters and was declared a new nation state with citizenship open to all. Over 21,000 people around the world have since registered as Nowherians and are helping compile the world’s first online national constitution. With a Facebook-style ranking system, its 2,500-plus propositions can be liked or disliked and viewed in order of popularity (at the time of writing most popular are the binaries ‘Every Nowherian has the right to be silent’ and ‘Every Nowherian has the right to be heard’); a fluid and boundless set of principles for a nomadic and borderless nation. 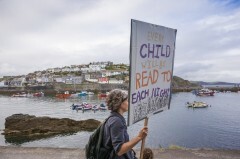 Since July, Nowhereisland and its land-based Embassy has journeyed west through Cornwall, Devon and into the Bristol Channel. Tomorrow it arrives in Bristol, its final destination, and a weekend of talks and performances will mark the last days of this ambitious Cultural Olympiad project that has sought to question the very idea of national identity and nation status. While he might remain an anonymous figure on-site, Hartley holds fast to his artistic control. 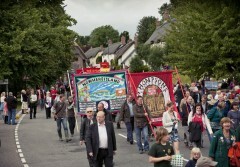 Arts Council England wanted the island to be a platform for dance and music performances, but Hartley insisted it remain unpopulated. Abject, alien, away from the shore, the work distils ideas of migration, longing and belonging into a powerful sculptural image that is kept always at a distance. Hartley is even hoping to send a portion of the island into space, at the suggestion of someone he met on the journey. The Last Days of Nowhereisland, 7-9 September 2012, Bristol (moored in Cumberland Basin) – a final weekend of performances, citizen march, live music, film screenings and a final farewell. 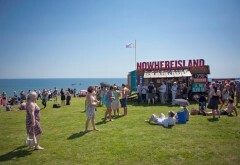 Nowhereisland is a Situations project led by artist Alex Hartley, one of 12 Artist Taking the Lead projects for the London 2012 Cultural Olympiad. Alex Hartley at Fruitmarket, Edinburgh– reviewed by Rosie Lesso. Wonders of Weston – Director of Situations Claire Doherty and artist Stephen Hodge on developing a contemporary public artwork for Weston-super-Mare.